We have been in amber jewelry business for more than twenty years, but could not imagine that one day we would create something that not just looked beautiful, but actually worked as a physical and a very effective solution. Sometimes opportunity is right in front of your eyes. Back in 2007, during the annual fair of amber, jewelry and gemstones me and my family were invited to the seminar where mineralogists were discussing amber properties. It all sounded quite well known and looked like a seminar for the beginners. But somewhere during the speech there was a topic about trapped insects in amber and a note that parasites such as ticks and fleas existed back in prehistoric times, but they were found in amber extremely rarely. The lead presenter has commented this detail saying that ticks and fleas had probably a negative feeling about tree sap so they avoided it. This made me joke in my head that nowadays women wearing amber should not be afraid of fleas and ticks. A couple of months later we started receiving first inquiries from our customer if we had collars for dogs and cats. Apparently the rumor about amber protective properties started to spread at that time. Such requests at first came as a surprise, but eventually we decided to investigate this case in a professional manner. I met our local vet and asked if he ever tried amber as a natural mean for tick prevention. But at that time he had never heard of such thing. I got back home and started researching the topic, contacting my friends from amber business and mineralogists. We have even visited a few institutes and independent research labs, talked to the personnel, found some scientific articles on amber effects and got fully convinced that amber could be used to solve the problems caused by ticks and fleas to our pets. After months of discussions we decided to test all the theory in practice. We live in the northeastern Europe and have a lot of ticks in the areas close to forests or even city parks. 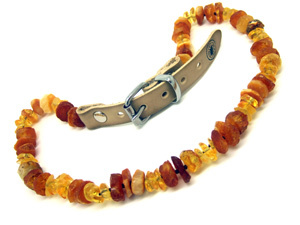 We took very rough unpolished amber stones, drilled the holes and put them on the string. Our dog Aras was the first to wear the collar. During the whole period (summer and early autumn) we have noticed no ticks on the dog and started to ask our friends to test the collar on their pets. That was the beginning of our everlasting experiments and improvements. Despite the resistance we have felt in the early days we finally managed to convince even the harshest skeptics. The major driving force that kept us moving forward was a high level of positive feedback from the first Ambertick users.